You have successfully installed SAP GUI on Windows (described in article How to install SAP GUI on Windows) and added destination IP / SID on it. 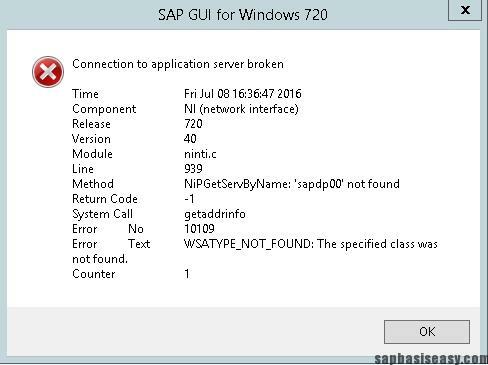 But you find error (picture below) “WSATYPE_NOT_FOUND: The specified class was not found” when you call the SAP Logon Item. It’s also said ‘sapdp00’ not found. change the port which is appropriate according to your SAP System Number. If your SN = 10 then you should put sapdp10 3210/tcp in your services file. Now restart your SAP GUI and retry.